Brewed with Aramis, a French hop from Alsace derived from Strisselspalt; alpha acid 8%. Fra kran på Brygg. Aprikosfarget. Filmskum. Tynn teppelacing. Lett ferskenaroma. Myk munnfølelse. Smaken tørket frukt. Lett tørr etter hvert. Bottle at home, 25th June 17. Pours straw Amber, good head and lacing. Aroma is lemon, yeast, sherbert. Taste is dry, lemony hop, slight sour, lemon grass, mild bitterness, interesting Aramis hop. Good lPA. On tap. Old note. The aroma has light citrus, bit grass, bit tea. Bit hazy, copper coloured beer with a slight off-white head. The taste is moderate bitter, has citrus, some bready sweetness, grass, some tea/herbal tones. Average carbonation, medium bodied beer. Nice. Cloudy light orange with an average fluffy head, yeast sediment. Aroma is bitter fruits, grapefruit peel, light herbal, yeasty, very little pine. Moderate sweet with a long bitter finish. Average carbonation with quite a filling palate. A good IPA, on the rough side. UPDATED: MAY 30, 2016 330ml bottle served in a pint glass. Pours a dark orange color forming a medium to small off white head with good retention and lots of lingering and molasses lacings left in the glass. Big chunks of gray yeasts floating in the bottom of the glass. Sweet and very fruity nose. Strong notes of pale and caramel malts. Strong notes of melon too. Flowery hops. Sweet upfront taste. Strong notes of melon and grassy hops. Moderated bitterness. Medium molasses body. Medium bitterness. Melon and grass in the aftertaste. Great drinkability. Great French IPA. Mont Salève rulez! Blonde orangée légèrement trouble. Fine mousse blanche. Nez d’ananas, de pêche et de fruits exotiques. Bouche pêche / ananas, légèrement boisée. Belle amertume, bonne carbo, corps un peu léger. 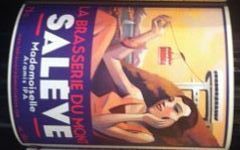 Très bonne bière comme toujours chez le mont Salève ! Tap at Borefts Beer Festival 2014. Pours a clear golden with a long lasting, white head. Aroma has huge citrus, mandarin juice, orange ice cream/sorbet, and maybe some pineapple. Some grains as well. Taste is even more grainy, has a hop bitterness and again these nice, ripe citrus flavors. Exiting taste but slightly boring, slightly watery body. Ottima Ipa che non è come tutte le altre...questo luppolo sembra dargli un sapore di fragoline...e di frutti di bosco...ci sono sia la dolcezza dei malti che la fragranza del luppolo che non è mai invadente e ti accompagna per tutta la beva. Magnifica interpretazione francese dello stile. Faranno strada...sono unici!